KAHULUI  Jessie Marcus wasn't expecting an airport protest when she arrived on Maui this weekend for a combination of work and vacation. But the Los Angeles television producer was impressed by the crowd that turned out at Kahului Airport to hold signs and hand out leaflets to voice their concerns about legal challenges to traditional Hawaiian rights and entitlements. "You can feel the passion," said Marcus, who after arriving on Maui on Friday night was back at the airport Saturday to pick up others. "No one's being aggressive, just patiently expressing something that's important to them. Airport security estimated that 150 people lined the airport access road before noon Saturday, holding signs, waving and generating honks from passing cars. Others gathered near the entrance to the airport terminals, where a tarp had been set up so two dozen or so kupuna could sit in the shade near a Hawaiian flag. Smaller groups were at designated areas below terminal escalators, handing out leaflets to arriving and departing passengers. Kapali Keahi, an organizer for Na Kupuna O Maui, which received a state permit to hold the informational demonstration, said sign-up sheets showed that more than 1,000 people participated in the demonstration from 5 a.m. to 8 p.m. Friday, although not all were at the airport at the same time. Even more people were on hand the same hours Saturday, Keahi said, to rally against a lawsuit in federal district court viewed as a threat to Hawaiian culture. "This is way bigger than we ever imagined," Keahi said. The lawsuit against the state was filed in U.S. District Court in Honolulu by Honolulu resident Patrick Barrett and seeks to invalidate Article 12 of the Hawaii Constitution. If that happens, some fear it could mean an end to the Office of Hawaiian Affairs and the Department of Hawaiian Home Lands, as well as Native Hawaiian gathering rights. "It's racism against Hawaiians," Keahi said. "That's why we're coming together, because we're all being affected by this case." Keahi said the group agreed to abide by airport guidelines in planning a peaceful demonstration. No arrests or incidents were reported as of noon Saturday, said Maui police spokesman Lt. Jon Morioka. While airport officials had urged travelers to arrive one to two hours early for their flights, state Department of Transportation spokeswoman Marilyn Kali said no flights or other airport operations had been disrupted by the demonstration, which is scheduled to conclude today. Na Kupuna's permit allows a demonstration from noon to 8 p.m.
"Everything's been going very smoothly," Kali said. "They have a message to get out; that's their focus. They have been wonderful to work with." As demonstrators held signs saying "Save Hawaii  Stop Barrett," "Stay Pono," and "Hawaii Aloha," many passengers honked and waved, flashing shaka signs in support of the protest. Even tour bus drivers and rental car vans blew their horns and flashed the shaka. At times, those near the tent played ukulele and sang as they waved to tourists and residents passing through the airport loop. 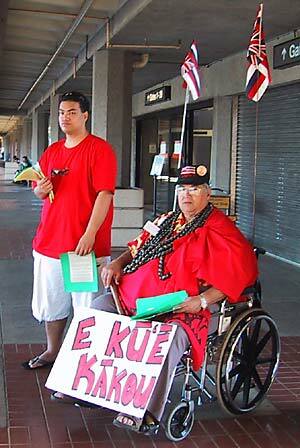 "This is uncommon, having a demonstration at an airport, especially a peaceful one," Keahi said. "What's important for everyone to know is the real issue is Barrett. "People came from Lahaina, Hana, Keanae, Kaupo, Ulupalakua  everywhere on the island to stand in solidarity." Among them was Carl Kaupalolo, a Maui fire captain who was on call at his job in case of an airport emergency Friday, but off duty and at the airport supporting the movement Saturday. "This is really important to us," said Kaupalolo, a member of the Kahekili chapter of the Royal Order of Kamehameha. "It's going to affect the rights of the Hawaiian people, the rights of the non-Hawaiians also." He worried that beach access and forest-gathering rights might be affected by the lawsuit. "Many of the Hawaiian organizations have come together," said Clifford Hashimoto, alii ai moku of the Kahekili chapter of the Royal Order of Kamehameha. "I'm not a person to go out and protest anything, but I'm so happy our group decided to come and support it." Hashimoto said he thought more people would get involved if they knew the demonstration was planned to be non-violent, without the tension that often accompanies protests. "This is not that way," he said. But despite the agreement between organizers and airport officials, some who gathered at the airport complained that the guidelines were too limiting by restricting where demonstrators could stand and what they could do. 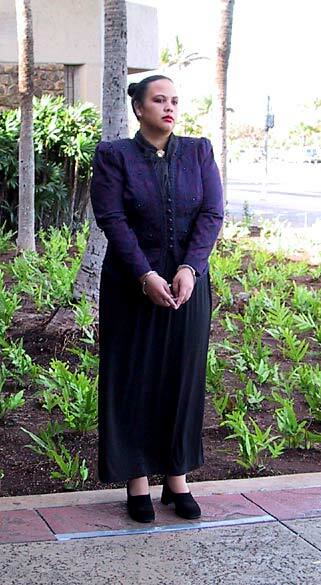 Cultural leader Charles Kauluwehi Maxwell Sr., who said he was not a member of Na Kupuna O Maui, complained Saturday that airport security had asked the group to stop a woman dressed in black and wearing handcuffs from performing as Queen Liliuokalani. On Friday, Maxwell had been cruising around the airport in his motorized (sic) wheelchair, handing out fliers and asking visitors to support Native Hawaiian rights. Maxwell said he was singing in Japanese to visitors from Japan, then handing out fliers and telling them to have them translated when they get home. He said he refused to be confined to the small boxes outlined on the ground as the three stations designated by the state Department of Transportation for handing out handbills. Protesters have been told to stay near the boxes and not be on other walkways at the terminal. Wailani Farm, a resident of the Waiehu Kou subdivision, was at the station across from the airport metal detector area. Farm said she was complying with the requests of the kupuna to play by state Department of Transportation rules and not create a problem at the airport. "But if it was up to me, we'd be on the runway," she said. "I wasn't in agreement for asking permission in the first place." Pikake Summers of Kahului stood in the little square marked out on the sidewalk, which measured about 2 feet by 3 feet. She declared that it was her little piece of ceded land, property that had belonged to the Hawaiian Kingdom. "But I don't think it's big enough for my husband and three children," she said sarcastically. Summers said she was at the airport to support the cause of Native Hawaiians. "I'm here standing on the bones of my kupuna, and my three children will stand on my bones," she said. The Barrett case could actually prove good for Native Hawaiians, she said, because it could lead to a legal definition of exactly what her people are entitled to. It might be more than anyone expected, she said. "Barrett doesn't realize what he's started," Summers said. Bessie DeMello of Kahului said she had handed out many handbills to travelers Friday and believed they would read them. She said the Barrett case concerns her and all Native Hawaiians. Entitlements spelled out in the state constitution are not based on race as Barrett claims, she said. "It's our birthright," she said. Under the kupuna tent, Agnes Emma Mailou Louis said she was born and raised in Hana and over the years has seen many people come in and claim land in Hawaii as their own. "We need to see that we hold our aina for our great-grandchildren and the rest of our families," she said. Near the tent, Jacob R. Mau said the demonstrators were trying to comply with the state DOT restrictions, but it was frustrating. Protest organizers said the state would not let demonstrators march across the airport's crosswalks because they said it was unsafe. "Yet we need to get the message out," Mau said. "We've been such patient people, but we need to get what is rightfully ours. We pray that people will understand where the Hawaiian people are coming from." Some visitors seemed to have a vague understanding of the protest. "I thought it had something to do with Hawaiian rights," said Tom Drechsel of Seattle after passing by the sign-waving demonstrators Friday. Donna Laikin of Greeley, Colo., said she has been reading newspaper stories about the case during a monthlong stay in Hawaii. "I'm somewhat of a preservationist, and I think we need to preserve Hawaiian culture," she said. "We should do whatever it takes." Laikin said she has no problem with programs that exclusively benefit Native Hawaiians, likening them to programs that have been established for Native American tribes. She said homestead lands are what allowed early settlers to start populating the American West. "I don't think there's a land in the world that hasn't been taken over by somebody," said Los Angeles resident Peter Reynolds, who was at the airport to pick up a friend for a cruise around the islands Saturday. For those demonstrating at the airport, the issue was protecting Hawaiian rights and culture that also benefit the tourist industry, Keahi said. Maui native Stanley Chock, 68, joined his wife, Leilani, and chihuahua-terrier Cindy near the kupuna tent, worried that the federal lawsuit could further delay his 12-year wait for homestead land. Chock, who returned to Maui from Oahu after retiring in 1997, said he has been awarded a lot in Waiehu Kou, where construction on a house was supposed to begin this month. "But now I don't know," Chock said. "Possibly I going to have to wait another couple of years. A lot of guys before me, they waited 50-something years, and some of them gone. "I cannot afford to wait another couple of years. I like enjoy the rest of my life in Maui."